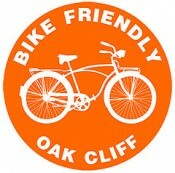 Bike Friendly Oak Cliff is nearing a year in existence, and we’ve learned quite a bit in that short time. It’s been heartening seeing the number of people come out on our rides, and the businesses get excited about helping us out with discount programs. Some events have been well received, and others have had smaller turnouts, but all in all, it’s been amazing seeing the community go to bat for us. Early on, we expected most of our lobbying to come against strong opposition from drivers, but that simply hasn’t been the case. The most surprising opposition we’ve experienced has been from veteran cyclists. Typically, people who ride 30 miles a day and have either given up their cars or limited themselves to 2 or 3 trips a week. These riders often spend thousands of dollars a year on cycling and will take vacations to bicycle across the country. These are not the people we’re attempting to appeal to. We’re advocates for the average Joe and Jane who just bought a new Schwinn at Target for $80 and are interested in starting to dip their toes into the world of cycling. They may not be brave enough to bike to work right now, but they might just take a trip to the local post office. They may not go all out and buy helmets, riding pants, and sign up for a bicycle safety course, but that’s okay…they simply want to remember what it was like to be self-propelled and carefree like they were before ever climbing behind the wheel. It’s that first step that can completely change someone’s future habits. We’re also advocates for the kids who live a mile from school and who desperately want to experience the freedom of being able to wind through neighborhood streets and lock up at the local library. We’re pretty much a Lycra-free group…not that there’s anything wrong with suiting up for cycling, we just want to help others take small steps so they can begin changing little habits like going to the grocery store and maybe not pulling out the Tahoe for the trip. Portland’s motto has been, “Make Bicycling Irresistible”. We think they’ve done a pretty good job of that. Sometimes it seems like the fearless and experienced riders among us forgot what it was like to be a newbie and first hop on that saddle and feel the wind while watching the pavement rush under your feet. They will sometimes put you down for not being more brave-hearted and jumping into the middle of a lane on a 6-lane street, or for being a ride-to-the-local-tavern only cyclist. Conversely, you’ll more than likely never hear a member of BFOC bragging about picking up the latest and greatest all titanium frame that was engineered by NASA, or riding from Dowtown Dallas to Fort Worth…that’s not our bag. In the end, our hope is that we build our community in such a way where our grandparents can easily and safely ride with their grandchildren to the market and back. Where businesses can take away a parking space or two, and open it up to wider patios for a livelier street. And where parents can comfortably ride with the family to the local farmers’ market. The reality is that not many among us that are just beginning to pedal-up again after years of living a car-only lifestyle are willing to start swimming by jumping off the high dive. The idea of riding to the local tavern is OK, but I recommend WALKING HOME from the local tavern. Alchohol and travel don’t go well together, regardless of the mode. BFOC would have been a plus had it done nothing more than save those Reunion bike racks (even before you count those discounts that I envy over here in Tarrant County). The world can’t have too many bike racks, regardless of differing opinions about the effects of bike lanes and of the virtues of following the rules of the road. Hooray! It is a point I’ve tried to make at EcoVelo – there are car snobs and there’s bike snobs – commuting snobs at that! Thank you for this article. BFOC sounds like my kind of club……if only you weren’t so far away!